The revised master plan for San Jose State University's Southeast Quadrant could pave the way for another tall student building on campus. Compared to the existing buildings, it looks like it may hit up to 15 stories at it's highest point and would wrap around a new recreation area, aquatic center, and dining commons. Once the general plan is approved, the real design work will begin. Ten months ago, FD&O began working on a project to develop a Facilities Master Plan for the southeast quadrant (SEQMP) of the campus. The SEQMP encompasses the area of campus south of Paseo de San Carlos, between 7th Street and 10th Street. Once the plan is approved by the campus, specific project design will begin. The purpose of the SEQMP project is to ensure a well considered road map for facility development in that part of campus. Given that we will be developing a new aquatic center, recreation center, additional student housing and expanded dining facilities on this portion of campus, planning is critical to ensure the best final development. Through the assessment of current facility conditions, proximity relationships, and long range construction and demolition plans, the SEQMP project will ensure that we build the best possible facilities to serve our campus. Ultimately, this project will be recommended for review and consideration by the Campus Planning Board, Campus Leadership and the Chancellor's Office. In the rendering above, the "Bricks" student housing will be removed. 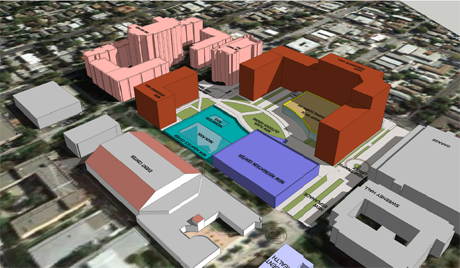 New housing is indicated in red, an aquatic center in teal, a recreation center in purple, and a new dining commons in yellow. Once the overall plan is approved by the campus, specific project design will begin. Da Kine Cafe is moving their Hawaiian restaurant from Sunnyvale to 23 N. Market Street. The space has been vacant for quite some time and was last occupied by Thepthai. It sits right between 19 Market and Sonoma Chicken Coop. Their new home will come in at an impressive 4,000 SQFT and feature an expanded menu from what they previously offered. My favorite part is 20 craft beer taps, further cementing Downtown as a haven for craft beer lovers. The extra bonus is Da Kine will have a stave for live music (and perhaps some cultural events). Can't wait! Saturday Stats: San Jose is Ranked the Happiest, Healthiest City in America! We nailed another great stat. Prevention magazine named San Jose the happiest, healthiest city in the US! The evaluated the 100 largest metros in the US and looked at 48 different measures of health, happiness, and well-being. These include metrics such as access to green space, number of farmer's markets, disease incidence, depression, unemployment, and FBI crime stats. San Jose scored high for people eating a ton of organic produce, 18 community gardens, easy access to healthy food, and great climate. I'm sure the employment and crime stats helped as well. San Francisco was a few steps behind us in 7th place. Finally the food truck from the future made famous for both quality ice cream and karaoke is bringing the party to it's stationary location inside of the San Pedro Square Market. Every Tuesday you will be able to sing some karaoke beside the truck, and if you do well enough who knows... maybe you'll get some free ice cream ;). San Pedro Square Market Special Events: Join us on Tuesday nights for Karaoke Club at Treatbot. From 7:30 - 9:30pm, bring your friends and your vocal chords for a singin' good time in the market hall. Sing some songs and enjoy awesome ice cream delectables at this weekly tradition at the market. EV Week 2013 Kicks Off Today! Electric vehicles are getting more mainstream everyday, and Silicon Valley is leading the charge (pun intended). Come check out the launch of EV Week 2013 today at Santana Row's Chess Plaza! All of the details are below. 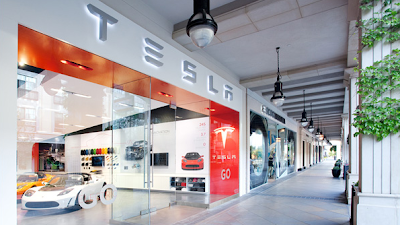 Also, don't forget to swing by Tesla's flagship US store while you're there. San Jose, CA – Charge Across Town (www.chargeacrosstown.com) is driving forward the adoption of electric vehicles in the Bay Area with “EV Week 2013: San Francisco to Silicon Valley” – a three-city, five-day series of events and activities designed to engage, educate and excite Bay Area drivers about the benefits, ease and accessibility of driving all-electric and plug-in hybrid vehicles. Driving towards California Governor Jerry Brown’s goal of getting 1.5 million zero-emission vehicles on California’s roadways by 2025, EV Week 2013 is inviting Bay Area drivers – from commuters to car sharers – to get behind the wheel of an EV and become part of the solution to reduce greenhouse gas emissions by driving greener, cleaner vehicles. San Jose Mayor Chuck Reed, San Jose City Councilmembersand Bay Area electric vehicle, technology, civic and environmental leaders, will kick-off EV Week 2013 with a launch event at Santana Row Chess Plaza, featuring free EV test drives around Chess Plaza and an Electric Vehicle Exposition showcasing the largest selection of new plug-in and all-electric vehicles, EV charging technologies, mobile applications, and car and scooter-sharing services. Thursday, September 26. San Jose Mayor Chuck Reed and San Jose City Councilmembers will speak from 12pm to 12:30pm. 12pm – 7pm – San Jose drivers enjoy free Electric Vehicle Ride & Drives around Santana Row Chess Plaza. The largest selection of state-of-the art plug-in and all-electric vehicles, including the new BMW i3, Ford Fusion Energi, Ford Focus, Ford C-Max Energi, Toyota Plug-in Prius and RAV 4 EV, Honda Fit, Honda Accord, Mitusbishi MiEV and Nissan Leaf. Demos of the first-ever ALL electric scooter and one of the nation’s first mobile solar charging stations. Interactive exhibits from: Tesla, Honda, Toyota, Ford, Nissan, PG&E, Schneider-Electric,Pandora, Zipcar, City CarShare, Scoot Networks, Chargepoint, DriveNow, Envision Solar, SAP, SunPower and the Center for Sustainable Energy California (CCSE). 12pm – 4pm – Electric Vehicle EXPO at Santana Row’s Chess Plaza. 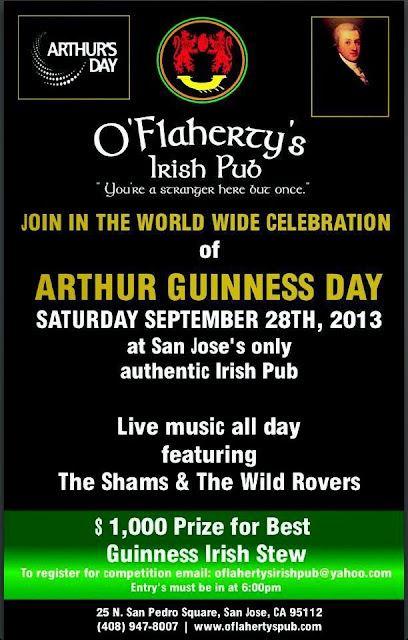 Come out September 28th celebrate Sir Arthur Guinness day at O'Flaherty's Irish Pub. There will be live music all day featuring The Shams & The Wild Rovers. Also, we will be giving out a $1,000 prize to the person who can make the best Guinness Irish Stew! To register for the competition simply email oflahertysirishpub@yahoo.com with your name and phone number. CREAM Ice Cream Shop Coming to Post St.
Another hot eatery is coming to Downtown San Jose! C.R.E.A.M. 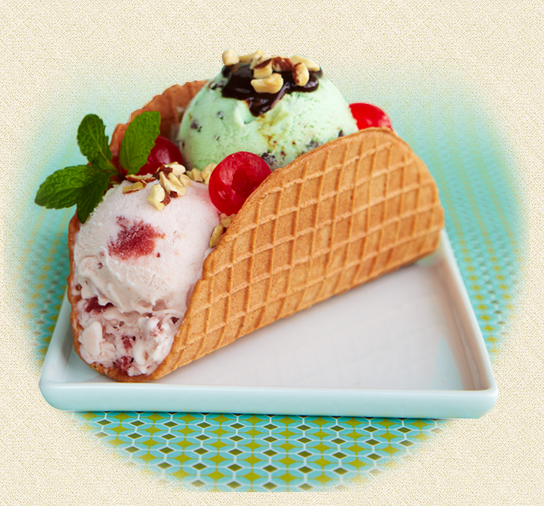 (Cookies Rule Everything Around Me) is a chain that specializes in customizable ice cream sandwiches and tacos, as well as milkshakes. They will be opening up shop at the corner of South First and Post, adjacent to 55 South and across from Original Gravity House. Things are really starting to turn around along this corridor. Side-note, I have added DTSJNews to the blogroll on the right. Great site, I just found out about it! Source: DTSJNews, Drew S., Joseph M.
I just learned about a great app called Silicon Valley Roots & Shoots. It's an insider's guide to Silicon Valley and lets you create your own Silicon Valley tour focused around the people and places that made this region the tech epicenter it is today. The app was created by David A. Laws, a 40-year veteran o Silicon Valley that has worked his way up from being a junior engineer to an executive at semiconductor companies such as Fairchild, AMD, and Altera. Currently he is a consultant and semiconductor curator at the Computer History Museum. It also has a comprehensive list of local landmarks, museums, companies, educational institutions and restaurants that comprise the historical fabric of Silicon Valley. I even found a few places that I had no idea existed. Everything is very well organized and the app makes it easy to hit up multiple places in a single area or city. The Silicon Valley Roots & Shoots app is available for both Android and iOS, and only costs $2-3. You can find more information about it over here. Love food? Community? Unique events? Be a part of a national photography project called My American Pantry on Saturday, September 29th at Montalvo Arts Center. Register (link at the end of this post), bring a picnic blanket and some goodies to share! Culinary artist, Andrea Blum, will position all participants in the composition she wants for the photo and a drone will fly above and capture the view! "The resulting photo will be included in an interactive digital atlas of American food and drink representing American food and entrepreneurship." See this as an example, taken in Marin County. Read the official release below for more information. Photo © Kenny Blum Photography and Andrea Blum, 2013. CALLING ALL FARMERS, GOURMET ARTISANS, AND FOOD & DRINK LOVERS: BE A PART OF THE AMERICAN PANTRY MAP! SARATOGA, Calif. – At 1:30pm on September 29, 2013, culinary artist Andrea Blum invites the community to participate in her national photography project My American Pantry: a celebration of creativity, taste, community, and entrepreneurship. Taking place on the Great Lawn of the Montalvo Arts Center, the event will begin with an aerial photo shoot, followed by a community picnic with participants sharing dishes prepared from family recipes. The resulting photo will be included in an interactive digital atlas of American food and drink representing American food and entrepreneurship. Begun in 2013, the My American Pantry (MAP) project is an interactive tapestry of people, food, story, and recipes that celebrate the American table, conceived of by culinary artist Andrea Blum. Traveling around the country, Blum documents the wide array of artisans, products, and food traditions native to different geographic areas. 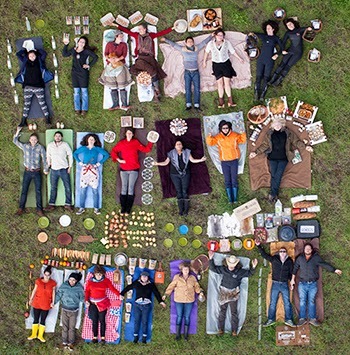 First arranging participants and the tools of their trade in a carefully designed composition, Blum then captures the image via aerial photography by means of a remote-controlled camera. The photo shoots also provide an opportunity to gather stories from participants about their practices, products, and their craft. The end-goal is to create an online and offline map of people, products, and stories allowing viewers and even shoppers to interact with the images and stories. Blum hopes to bring the finalized project from all 50 states to the World's Fair in Milan in 2015. More information about the MAP project is available at myamericanpantry.com. Born in Pennsylvania and raised in California, Andrea Blum is a journalist and chef turned entrepreneur. Her passion for food ignited as a child after eating her first French meal in a famous restaurant in Philadelphia at 11 years old. That experience changed the way she thought about food. At 20 years old, she took a year to study in France learning the history, art, and cultural significance of food that would quickly become part of a lifelong fascination. Though she later returned to France and Italy to resume her studies of fresco painting and art restoration, every moment of her free time was spent exploring the cooking, farming, and culture of the French and Italian food world, with mothers, grandmothers, master cheese makers, and artisans. In 2003, Blum traded her paintbrush for pen, graduating from Columbia University in Journalism with awards in social justice reporting. She has since worked as a reporter covering the environment in Northern California. But she has also stayed close to her passion for food, writing for newspapers and magazines such Gourmet and Saveur, and hosting tours to discover and indulge in Italian regional "food worlds" such as the Cilento and Amalfi Coast regions of Campania. Blum’s interests have always been related to the geography of food; she seeks to discover the stories each dish can tell whether it’s from the highlands of Tibet or in remote villages in Turkey. My American Pantry (MAP) is an extension of her geographic quest to follow food back to where it’s made. Only this time, she has chosen to focus on American artisan food, its rebirth, its crafters and its terroir. Blum's photo shoot is presented as part of the public programming organized around Flourish: Artists Explore Wellbeing, Montalvo’s latest multiyear programming theme, coordinated by the Lucas Artists Residency Program in collaboration with Montalvo’s Education Department. Through exhibitions, conversations, performances, and workshops, Montalvo explores the question, “How can we live meaningful, happy, and healthy lives?” For more information, please visit montalvoarts.org/flourish. What: A public potluck picnic and photo shoot, organized around the My American Pantry project to celebrate American food and drink. Where: Great Lawn of the Montalvo Arts Center, 15400 Montalvo Road, Saratoga, CA. Admission: It is free to participate, but advance registration is required. Please sign up at myamericanpantry.com/montalvo-picnic-photo. Renders of KT Properties' Proposed Towers in San Pedro Square! Below are images for the two towers that KT Properties is planning to build across the street from the San Pedro Square Market. In fact, you can even see the Market in the first three renders. 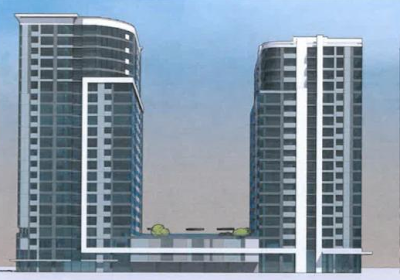 The project will total 612 apartment units between both towers. One of them will be 20 stories (210 feet tall) and the other will be 22 stories (228 feet tall). In between the towers is an amenity courtyard with a pool, garden, and bocce ball court. I love the design. I think it looks really sleek and pushes the design bar further for future high-rises. While the buildings use a similar design language, the towers themselves are different. 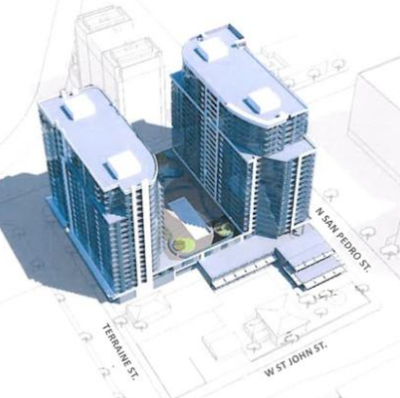 Hopefully this will put an end to all of the identical-looking "sibling" buildings Downtown. Oh, and did I mention it will include 13,000 SQFT of retail? This is a huge win for Downtown! Thing are looking up for the airport. Passenger traffic rose for the seventh consecutive month in a row. In July 813,628 passengers went through SJC, which is a substantial 5.4% increase over the same month in 2012. Overall, SJC traffic is up 4.9% year-to-date, which means growth is accelerating over time. Sure there were some extraneous factors in there like the Asiana crash and the economy, but this is a good sign for the airport. Keep in mind that the city owns the airport, and the profits (or losses) eventually flow back to San Jose. Valley Fair is about to get one of the very first Halston retail stores. This particular designer is known for "retro" styles based in the '60s and '70s. What makes this significant is that there are only two Halston Heritage standalone stores in existence, one in New York City and the other in Los Angeles. This would make San Jose it's third location and the only announced store for Northern California. Valley Fair is turning into a destination for these exclusive hard-to-find brands. It's days as a typical suburban mall are numbered, especially with their future expansion that will bring many more unique brands, Neiman Marcus, Bloomingdales, and a Santana Row-ish outdoor area. "It means that some locations are limited to 25 or even 20 stories, which isn't tall enough to justify the very large additional costs of steel construction (typically required on anything 10 stories or more). We also have a high water table due to the proximity of the Guadalupe, so developers have to pump water--permanently-- in order to install underground garages. So, our geography undermines our ability to build a skyline. That's why I'm proposing next week that we move the airport to Moffett Field. Just kidding." It's a great read, definitely worth 15min of your time! Again, here is the link. 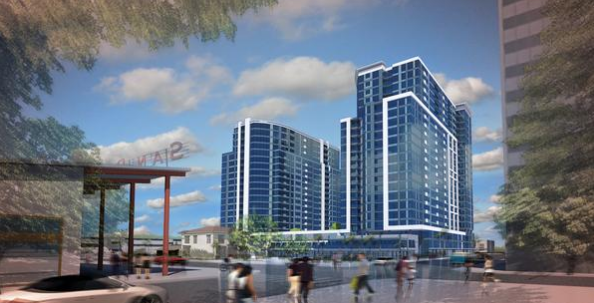 Is There a Second New Westin Hotel Coming to Downtown San Jose??? I have one big question for tonight, what is this project below? 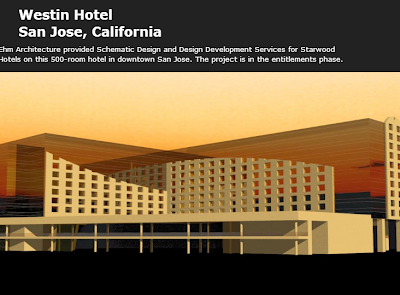 At first I thought this was Lew Wolff's re-branding of the Sainte Claire as the Westin San Jose. Have a close look... even in the completely unlikely scenario that the City would allow a developer to dramatically face-lift a historic building, there is no way they could make it look like the render. The Sainte Claire is a six story building while the render is either 11 or 12 stories. The shape is also completely different. So again, I ask the question... what the heck is this project? The text below reads: Ehm Architecture provided Schematic Design and Design Development Services for Starwood Hotels on this 500-room hotel in downtown San Jose. The project is in the entitlements phase. Could this be a brand new, unannounced project in the Downtown area? 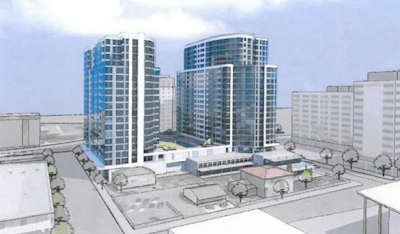 Downtown San Diego has two Westin Hotels, so it may be a possibility. If anyone has any other news, please send it in. Huge hat-tip to Franco for finding this. TWO BUCK Tuesday is this week on September 17th, 7pm-10pm at KALEID Gallery! 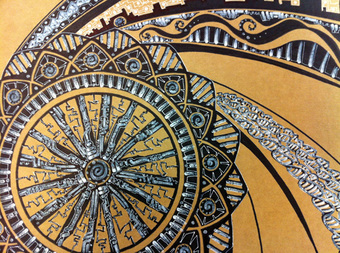 KALEID artist Joe Perea will be sharing his unique way of drawing, and will help you come up with your own work of art using his technique of building upon circles as a starting point. He believes anyone can learn to draw and express themselves with confidence and he loves inspiring people to try it out for the first time. 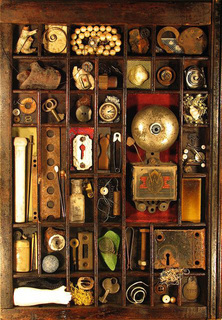 Artist Carolann Espino will demonstrate the art of creating assemblage and decorative boxes using various types of objects, vintage glass, odd objects, curiosities. 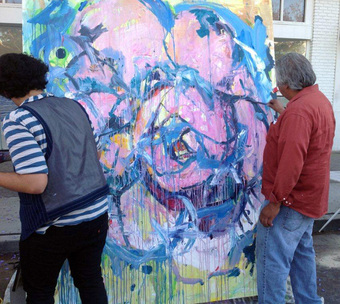 She will demonstrate the way to create a crackling effect as well as training your eye to create unusual art objects. Bring your own boxes due to supply limitations. However,nobody will be turned away from the demonstration. Her motto is "Think outside of the box." "Be Bold and Allow yourself to express whatever is revealed. That is the best art because it expresses your authentic self. Pals Lacey and Lara spent many years playing with colorful, smudgy oil pastels together. They are reuniting for this evening to teach you how to have fun doing collaborative drawing in oil pastels. 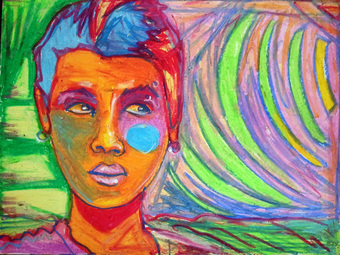 There will also be a special $2 sale of lots of oil pastel drawings from the vault! 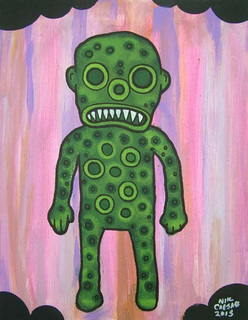 Nik Caesar will create little monsters for your pleasure. 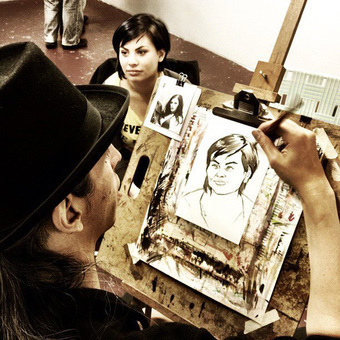 David Mejia will draw your portrait while you wait. 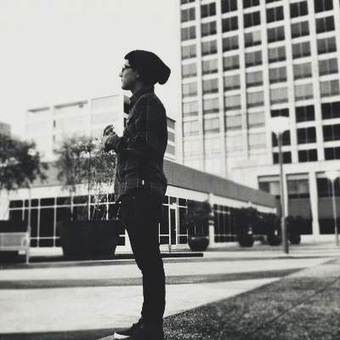 Enjoy sweet beats by Illvino! 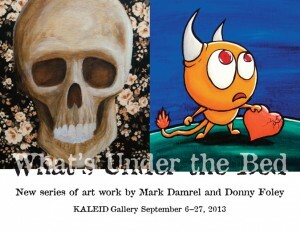 And check out the feature exhibition What's Under the Bed new works by Mark Damrel, and Donny Foley. TWO BUCK Tuesday is September 17th!